When we want red raspberries, we usually buy them frozen, since they are available year round and can be found in most supermarkets. 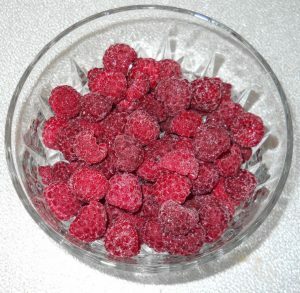 Another advantage is that frozen red raspberries can be stored in the freezer for months, so they are always available. We love to add them to cereal and mixed fruit recipes, where they add a sweet-tart taste. There are several species of red raspberries, but all have a similar taste. We could not find specific information for frozen red raspberries, so we included only the information for the raw raspberries below.